True or False: Many brands of bottled water are simply tap water? | Was Mom Wrong? True or False: Many brands of bottled water are simply tap water? Many people believe that bottled water is a healthier option than tap water. Marketers certainly take advantage of this; you often see commercials or print advertising campaigns for bottled water that depict snowy mountain peaks and clear, glistening springs or rivers. You see healthy, active people drinking bottled water while out riding their bikes or after going for a run. Bottled water is big business. The worldwide market is estimated to be roughly $50 billion, with the United States accounting for $9 or $10 billion of those sales. The growth of bottled water sales in developed countries ranges from 5%–20% a year. Drinking bottled water can be expensive. We pay roughly 5 cents per ounce for bottled water ($1 for a 20-ounce bottle), whereas we can drink a gallon of municipal water out of our tap for less than a penny. I find it a bit ironic that I am writing this chapter in an airport, and I forgot to bring my water bottle! So I had to shell out $2 for a 20-ounce bottle of water. My goal is to refill that bottle at least 20 times on the trip to get my money’s worth. All of those plastic water bottles can have a negative impact on the environment. According to estimates, approximately 80% of water bottles are not recycled, instead ending up in forests, lakes, streams and other inopportune places. That amounts to over a million tons of plastic-bottle waste per year. And consider the significant environmental cost of the energy needed to produce all those plastic bottles as well as to transport and refrigerate the water. Surveys show that the primary reasons people drink bottled water are a taste preference of bottled water compared to tap water and the belief that tap water is tainted with toxins or contaminants. The sale of bottled water in a particular city or region usually spikes following problems with a municipal water source, and sales in those areas can stay elevated for years. It’s hard to regain trust after an incident with a municipal water supply. Plus drinking certain brands of bottled water is considered a status symbol—again, thanks to advertising. I find it interesting that so many people automatically believe that bottled water tastes better than tap water. I’ve read about blind taste tests in large cities such as New York and Cincinnati where people actually prefer the taste of tap water. Estimates show that from 25%–60% of bottled water is simply tap water that has gone through some type of a purification process. That is exactly the case with the water I bought at the airport; it said “Purified” in large letters on the top, but I believe it was bottled in Atlanta, GA.
Van Hulle and colleagues (2012) conducted a study where they compared the chemical quality of bottled water and tap water and concluded that the main discriminating factor for tap water is the slightly increased chloride content. It was otherwise not possible to differentiate the tap water from the bottled water, indicating that the chemical composition is not statistically different. I’ll admit that I do buy some bottled water, but I usually buy it by the case (for cost) and reuse a bottle as many times as I can once it has been opened. 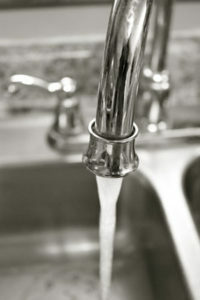 I have no hesitation about drinking water out of our home tap, and I can’t tell the difference between the taste of our tap water and bottled water. Van Hulle, S., and Ciocci, M. Statistical evaluation and comparison of the chemical quality of bottled water and Flemish tap water. Desalination and Water Treatment (2012), Vol 40, pp. 183-193.